WINDSOR SQ. 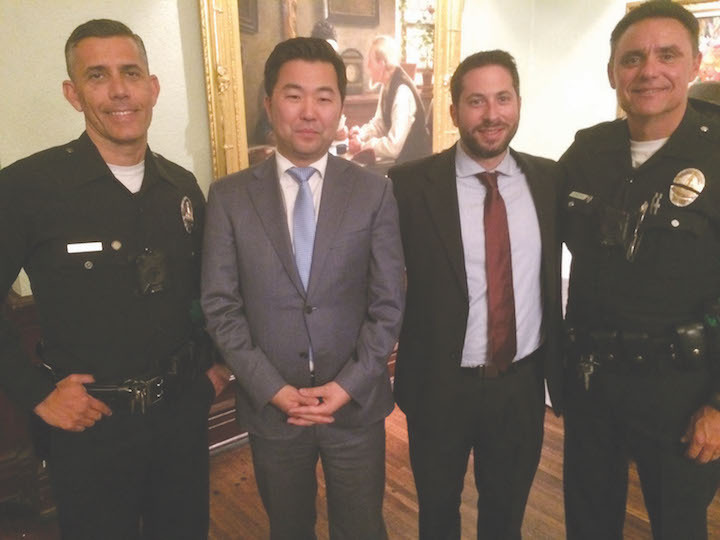 TOWN HALL attendees included LAPD Senior Lead Officers Joe Pelayo and Dave Cordova, at left and right, and Councilman David Ryu, second from left, and Ryu’s field deputy, Rob Fisher. The Windsor Square Association (WSA) held its annual Town Hall Meeting at The Ebell of Los Angeles on Nov. 15. President Larry Guzin welcomed residents and introduced WSA board members as well as District Four Councilman David Ryu and his field deputy Rob Fisher. Councilman Ryu spoke of the efforts made to save the trees in front of Rite Aid on Larchmont Boulevard. While not successful, the process resulted in an improved replacement tree program and highlighted the need for more staff in the Urban Forestry Division of the city’s Bureau of Street Services, said Ryu. 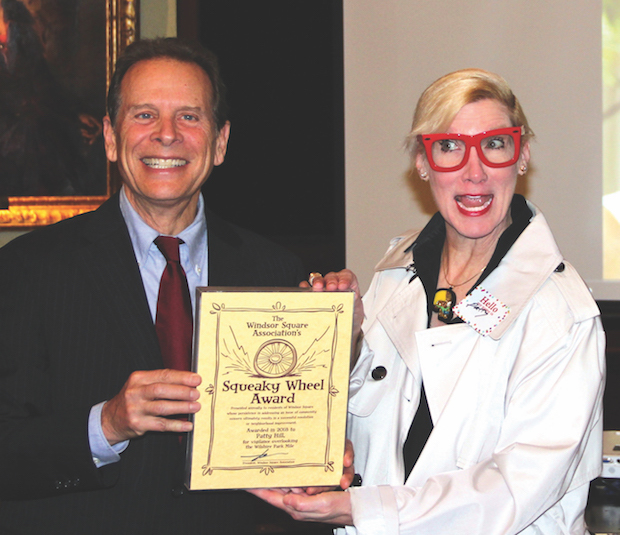 SURPRISED at being awarded the Windsor Square Association’s 2018 Squeaky Wheel Award, Patty Hill thanked association president Larry Guzin. The councilman then said traffic is his next priority, although studies show that fewer millennials drive in the city. Also, more companies are using a work-live model, said Ryu, hopefully making commutes unnecessary. In response to a question from WSA vice president John Welborne, Councilman Ryu told how, with local neighborhood support, an abandoned public library at 1403 Gardner St. (at DeLongpre) is being re-purposed into a 30-bed “bridge housing” facility for homeless women. In audience comments to Councilman Ryu, there was outrage expressed concerning the dangers posed by skateboarders and scooters on sidewalks. Mr. Ryu responded that such pedestrian versus vehicle conflicts remain a concern of his office, and that he and his staff are working on the issue. He also said that our new chief of police has assigned 200 additional police officers to foot patrol. At that point, WSA board member Steve Tator introduced Senior Lead Officers Joe Pelayo and Dave Cordova. The officers emphasized the importance of reporting all crimes, as the data by which LAPD decides where to allocate resources comes from such reporting. Max Loder, of the Department of City Planning, discussed recent staffing increases in the department’s Office of Historic Resources that allow Historic Preservation Overlay Zone reviews to be completed in a more timely fashion. Next, John Welborne, as the WSA’s vice president for planning and land use, spoke of the sale of the 14-store retail building on Larchmont Blvd. known as the Lipson Building, and he also noted that there is a new menswear store at 107 N. Larchmont Blvd., the former home of an illegal restaurant. President Guzin, following up on the earlier comments by Councilman Ryu, expressed pride in the canopy of trees in Windsor Square and spoke of the WSA’s philosophy: a tree should not be removed unless it is dead, diseased, or dangerous. Board member Helen Hartung reported that, after much research, the WSA’s Canopy Committee had concluded that the Saratoga bay laurel is a great choice to replace aging Larchmont ficus trees, due to the laurel tree’s durability and pleasing aesthetic. She said her committee also believes that metal grates should be installed around the Larchmont sidewalk trees to make the sidewalks more passable.